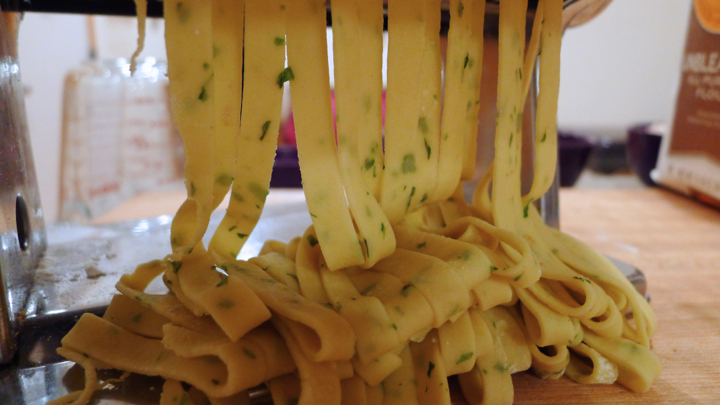 My mom gave me a pasta machine recently which I’ve been excited to use, so when I got some basil in my CSA this week, I figured I’d get fancy and make some basil fettuccine! 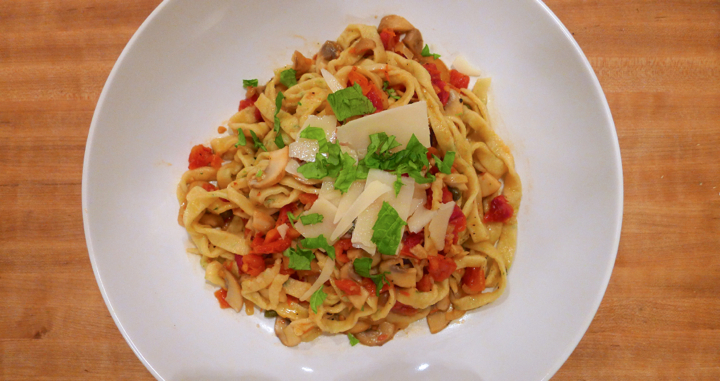 I’ve never made my own pasta before and had a lot of fun doing it. It was a lot easier than I thought it would be, and it came out pretty good for my first try! 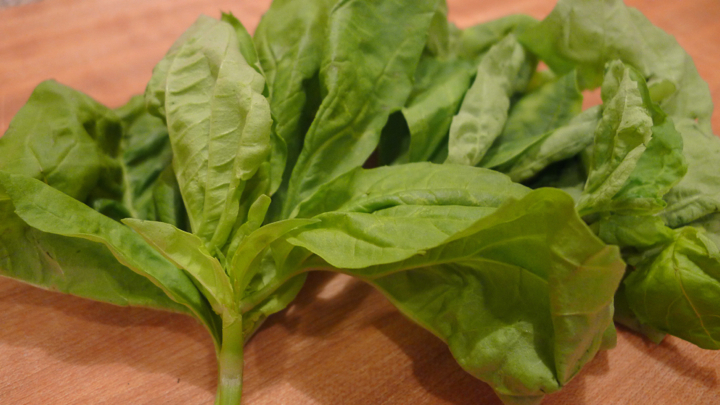 You can add any herbs you like, or even beet juice to give the pasta a beautiful color- the options are endless! 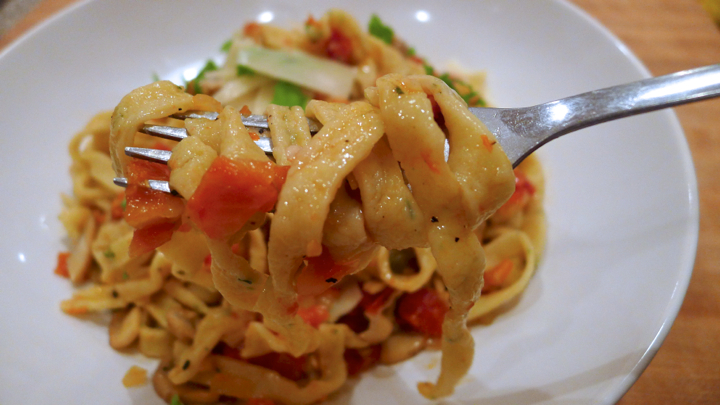 Start by making the pasta. 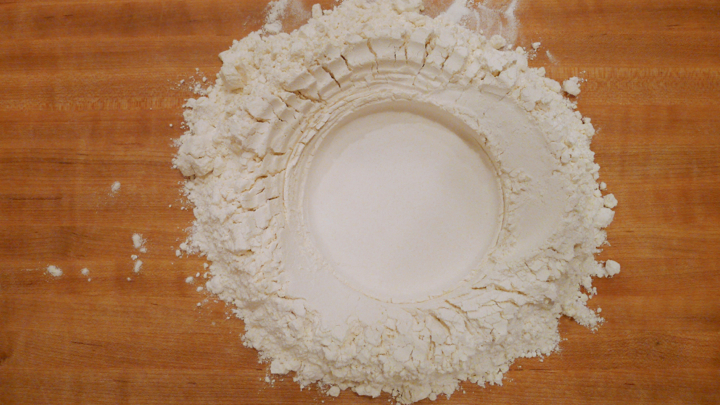 Place the two cups of flour on a clean surface and make a little well in the center. 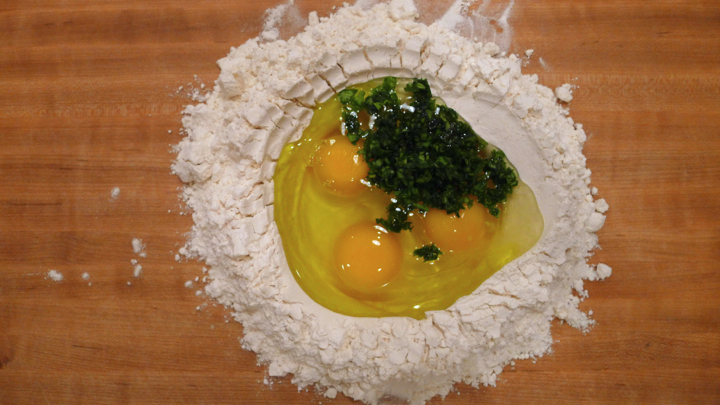 Add the eggs, fresh basil, and olive oil to the center and whisk the eggs until well incorporated. 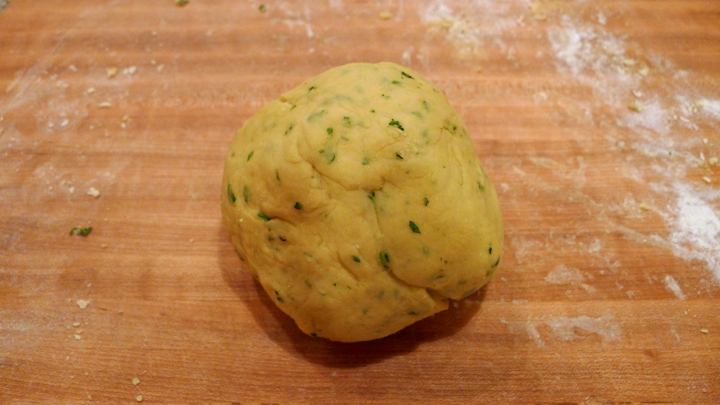 Start scooping in bits of the flour to the center, mixing to incorporate a little at a time. I made the mistake of breaking the circle and my eggs started to spill out, but I just simply used my hand to hold it back until I mixed enough flour into the eggs to keep it from running any more. 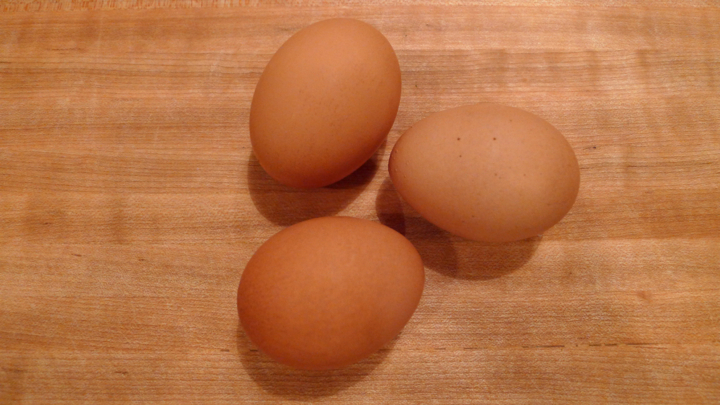 Once all the flour is mixed into the egg, start shaping it with your hands. It’s going to be very sticky at this point, but continue kneading for about 10 minutes. 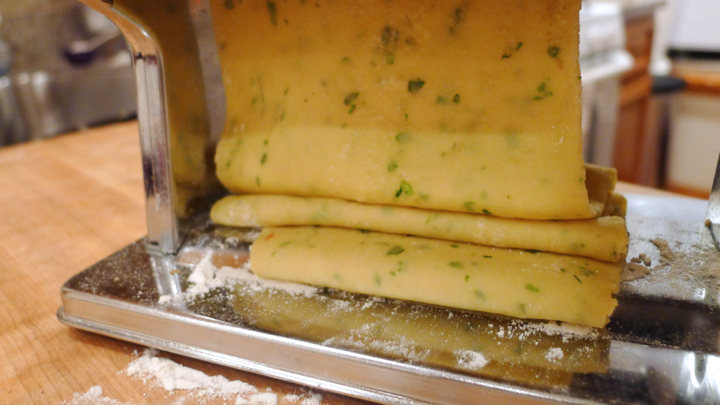 There’s really no wrong way to knead the dough, just keep folding it over onto itself and massaging it like crazy! After a while you’ll notice that it pretty firm and no longer sticky. Wrap in saran wrap or with a kitchen towel and set aside for 30 minutes. 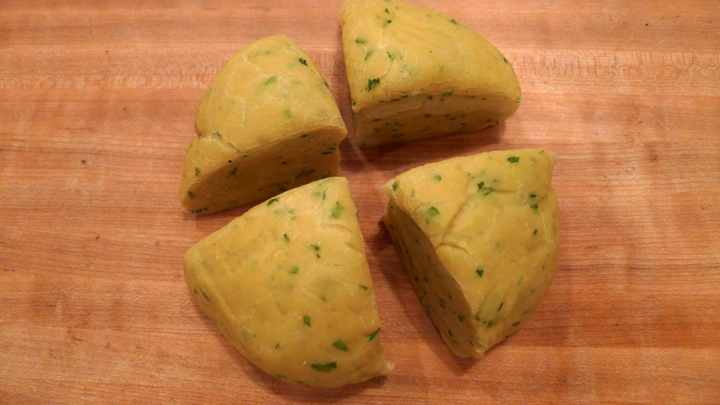 Once the pasta is ready, cut it into quarters. 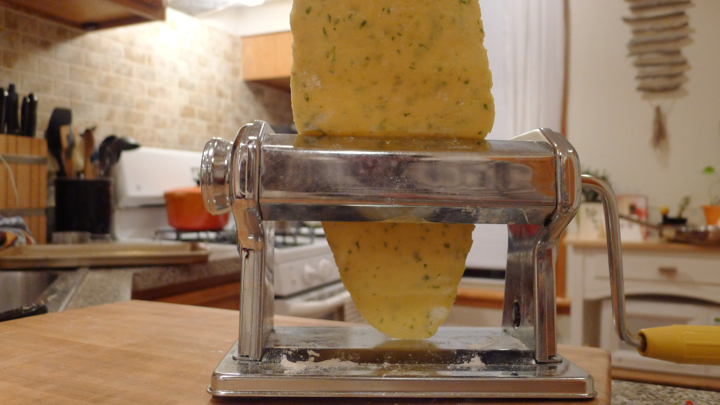 One chunk at a time (while the others stay covered as to not dry out) run it through the pasta machine on the thickest level, and continue running it through the other levels until you have the thickness you like (I started on 1 and ended on 5.) Lastly, run the pasta sheet through the fettuccine blades and toss onto a baking sheet with some corn meal to keep it from sticking. 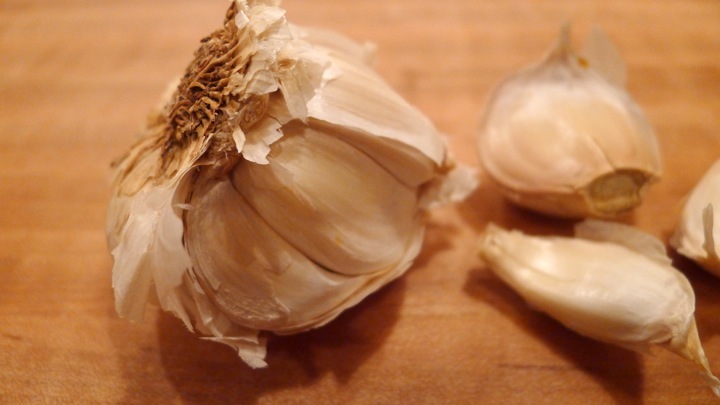 Cover the pasta with a dish towel and get a large pot of salted water boiling. In the meantime, make the sauce! 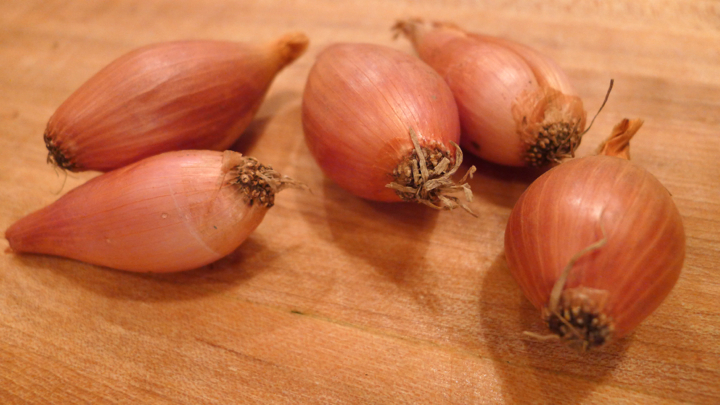 In a large skillet over medium heat, cook the garlic and shallots in some olive oil until translucent. 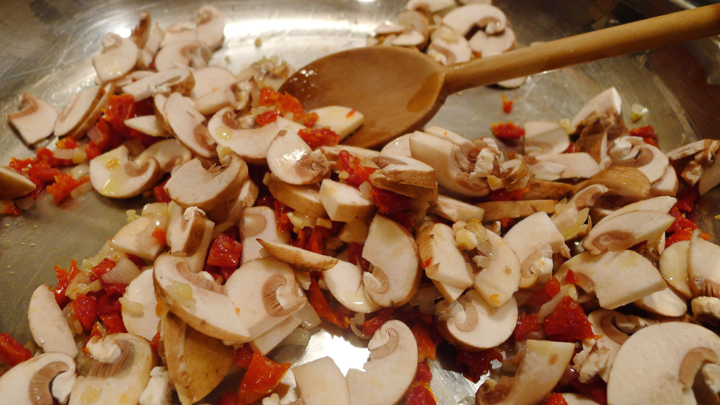 Add the sun dried tomatoes and cook for a minute or two before adding the mushrooms. 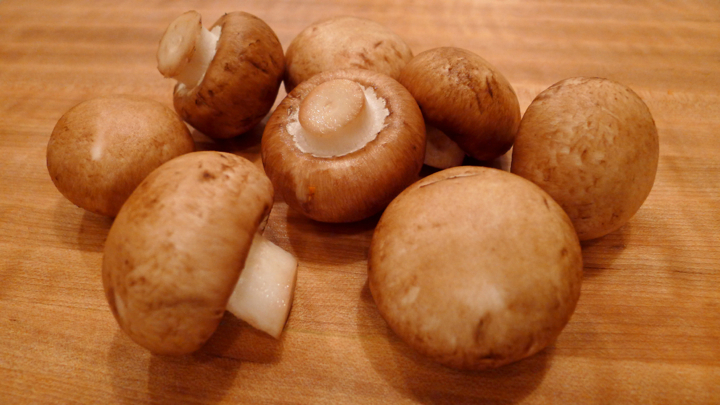 Once the mushrooms have cooked down a little, add some of the chicken stock and cook for about 5 minutes. 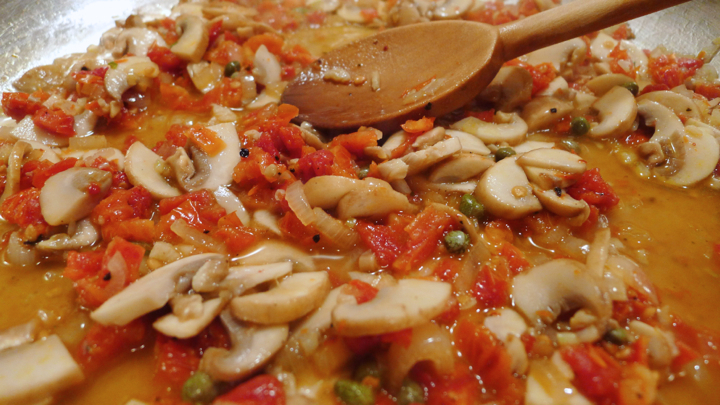 Next, add another splash of stock, followed by the capers, red pepper flakes, sherry vinegar, lemon, salt and pepper. Cook for another 10 minutes, adding more stock every once and a while. 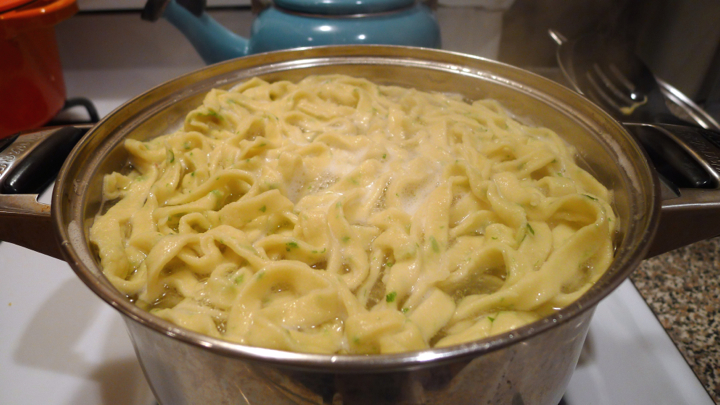 Place the pasta to the boiling water, making sure to swirl it around the pot to not get stuck. 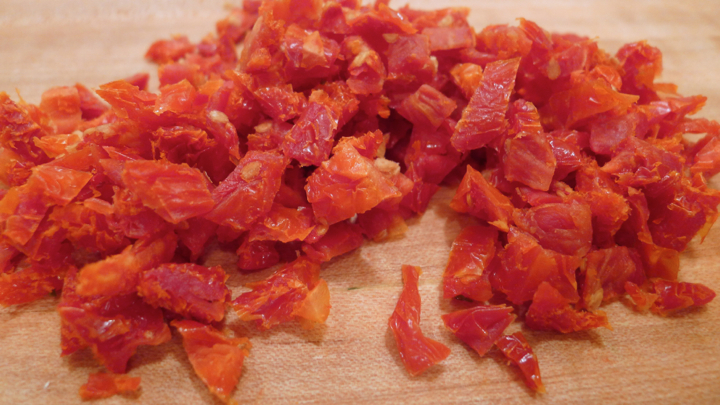 Cook for about 3-5 minutes depending on the consistency you like. 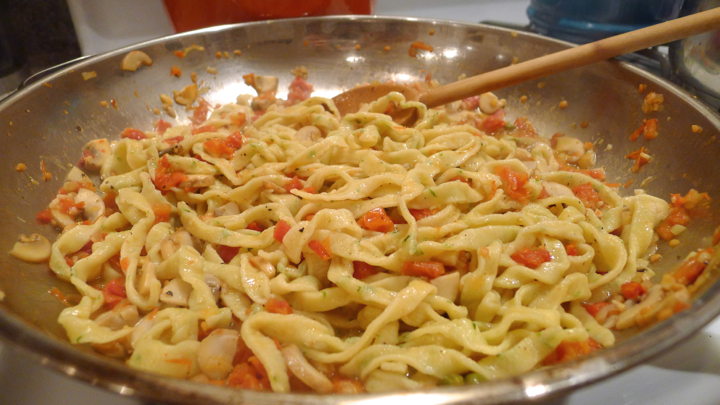 Drain and add to the sauce, mixing well to cover the noodles. Add a splash of chicken stock or pasta water if it starts to dry out. 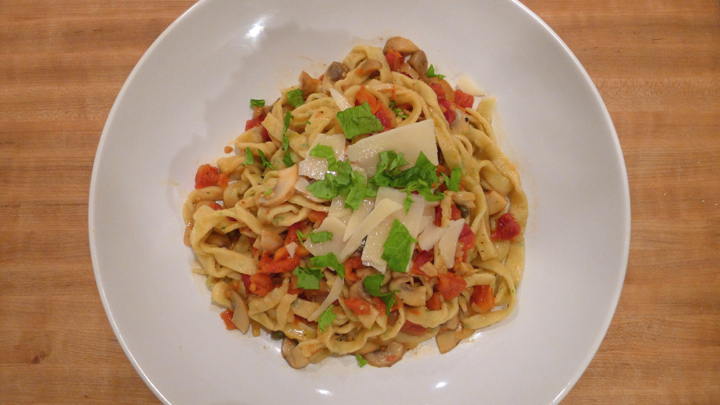 Serve with some fresh grated Parmesan cheese and chopped basil. Enjoy!